Heat oven to 350ºF. Make cake mix as directed on package for angel food (tube) pan -- except stir cocoa into cake mix (dry). Bake 37 to 47 minutes or until top is dark golden brown and cracks feel very dry and not sticky. Cool completely, about 2 hours, as directed on package. Mix cherries and cornstarch in 2-quart saucepan. Cook over medium heat, stirring constantly, until mixture thickens and boils. Boil and stir 1 minute. Cool completely. Mix whipped topping and almond extract; spoon onto slices of cake. 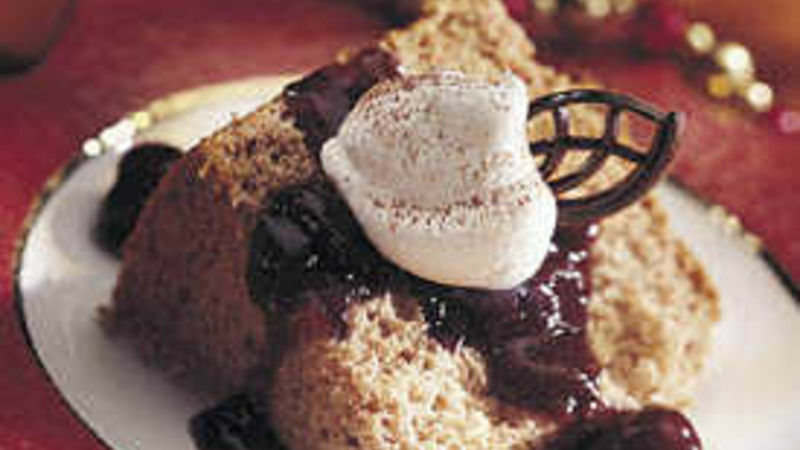 Top with cherry mixture. Sprinkle with almonds. Do-Ahead Tip Once this chocolate cake has been baked and cooled, it can be tightly covered and frozen up to 2 months. How-To Toast nuts by baking, uncovered, in an ungreased shallow pan at 350ºF for about 10 minutes, stirring occasionally, until golden brown.